At the former HQ of the Port of London Authority, one of the most iconic buildings in the City of London, the luxury Four Seasons hotel comes with a restaurant from acclaimed three Michelin-starred chef Anne-Sophie Pic. Occupying one of the most iconic buildings in the City of London. One of the most iconic buildings in the City of London, Ten Trinity Square, has been sympathetically transformed into a luxury Four Seasons hotel. 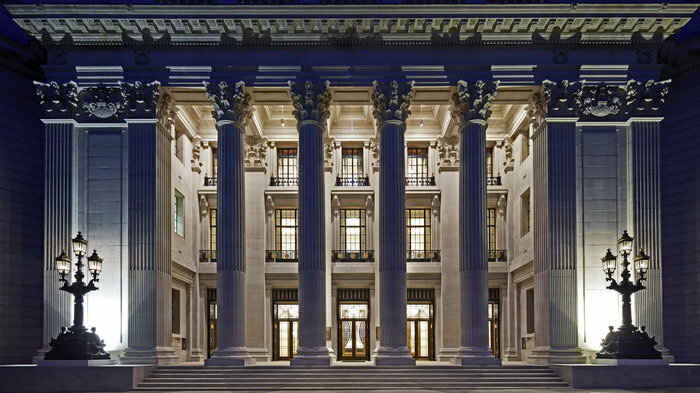 The landmark grade II* listed building, originally the headquarters of the Port of London Authority, opened in 1922 to a design by well known architect Sir Edwin Cooper. The hotel - the third Four Seasons Hotel London (adding to the two existing hotels at Park Lane and Canary Wharf) - occupies the lower ground to the third levels, with 100 guest rooms and suites, two restaurants, bars, meeting salons and spa. Three Michelin starred French chef Anne-Sophie Pic runs one of two fine dining options. Chef Anne-Sophie Pic, the fourth female chef in history to be awarded three Michelin stars, and the only current French female chef to hold the position , has her first restaurant in the UK with La Dame de Pic , one of two fine dining options within the Four Seasons Hotel London at Ten Trinity Square. The 78 cover restaurant, which has been designed with a nod to the historical Parisian brasseries in a space that is classically English in design, offers a welcoming, relaxed environment with natural wood flooring, carved woodwork, curved leather banquettes and columns covered with beveled mirrors. The food showcases Anne-Sophie's passion for unexpected flavour combinations with a focus on seasonal and local ingredients. Contemporary Chinese and Japanese cuisine in a beautifully decorated dining room. With a name inspired by the Chinese and Japanese terms for plum blossom, it's befitting that Mei Ume is beautifully decorated with a hand-embroidered silk screen featuring the delicate pink flowers. One of two restaurants within the Four Seasons Hotel London at Ten Trinity Square, Mei Ume joins La Dame de Pic at the luxury hotel in Clerkenwell, along with the Rotunda Bar and Lounge. Whole Peking duck is one of the standout dishes at the Asian restaurant run by head chef Tony Truong, formerly of Royal China. Sushi and dim sum are also specialities thanks to the talents of chef Mun Seok Choi, who previously worked at Sake no Hana, and Liang Kian Cheng, who joined from Yauatcha. Particularly good is the finest Wagyu beef sourced from Kagoshima and served with a choice of Japanese spicy BBQ or sake butter sauce. Cocktails under the beautiful domed ceiling at the heart of the Four Seasons. At the heart of the Four Seasons Hotel at Ten Trinity Square The Rotunda Bar forms a natural gathering space for visitors and guests. The building's past as headquarters of the Port of London Authority is reflected in everything from the maritime-inspired architecture and interiors to the cocktails. Head Bartender Michal Maziarz and his team serve cocktails including the Forget-Me-Not with tiny blue flowers around the base of the glass - a nod to the flowers sailor's wives wear to pay tribute to their husbands at sea. Enjoy cocktails in the elegant setting, under the beautiful domed ceiling, a replica of the original, which was badly damaged during WWII. From cheap budget places to stay to luxury 5 star suites see our special offers for hotels, including The Trafalgar St. James London, Curio Collection by Hilton from 51% off.